"Can homeless people join the army?" "Erm, no...probably not". I was caught out so I answered with the confusion I felt. "I'm just wondering because they keep asking me for money and I thought they should just join up instead of living off us all!" So, Mr. Blair, there's your answer. Give them all guns and send them to Iraq. Easy. I often hear things whilst on stand-by and, as I have done so in the past, share them with you all. I'll be able to look back at this and remember what I experienced too. Like the guy who passed the car with his headphones on, happily singing 'Whisky in the giro'. He too, was serious. I went to a very poorly old lady with DIB. The doctor on scene described her condition as a "slight exacerbation of her COPD (chronic obstructive pulmonary disease)". I thought this was an understatement when I went upstairs to her room at the nursing home. She was on her last breaths and needed to be in hospital. An earlier call took me to a man 'collapsed, unconscious' in the street. Passers-by had tried to rouse him but got no response. They dialled 999 and waited for me to turn up. I went to the little crowd that had gathered around the collapsed male and I recognised him immediately. He was one of the 'faces' of that area and was a known alcoholic. I tried to get him to respond but he was refusing to play the game, so I entertained the doubt that he might not be faking and set about getting obs whilst thanking the people around him and gently ushering them away. I took his BM and temp and all the other stuff I need to identify an obvious problem. Apart from a slightly low BM, nothing shouted at me. I checked his pupils and they were pin-point. I considered the possibility that he had taken something other than booze for breakfast but when I checked his pupils again, they had returned to a normal size. The light can play havoc with a pupil test. I waited with him for ten minutes. I tried again and again to make him see sense but all he did at most was swing his arm out at me. I was still convinced he was play-acting. 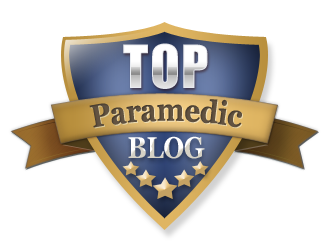 When the ambulance arrived the attendant walked over to him, shook him once and he instantly recovered. He thrashed out, told us all to f*** off and marched away to his next corner. I wonder if some of the homeless can join the army after all? I went to check on a ? fractured hand and the patient, whose hand certainly looked broken, requested to be taken to a specific hospital which was out of my area of operation. I explained this and he insisted that he was too stressed and depressed to go anywhere but where he felt comfortable. I was standing in the front room of a dark and untidy little basement flat which he, his mates and a well behaved dog shared. I noticed that there was a great deal of extra strength lager available at this host's abode. Incidentally, I have noticed that street-people have extremely well behaved dogs. It must be the bond created when you have to rely solely on one person to feed you and keep you warm. I know of one guy who begs for money in the street and has his dog lie there with a baby's dummy (pacifier) in its mouth! It attracts all the girls and he gets enough money for food. He is a nice guy and I often stop and talk to him, as I do with some of the others but he has more cheek. Back to my patient. I asked him how he came to have a badly swollen and bruised hand and he simply said that he couldn't remember. His friend said he had been fitting on the floor and that he might have smashed his fist on something. I concede that, being an alcoholic, he may have had a fit and he could have smashed his fist whilst fitting but his friends were at odds with each other from the start and he was very shy about going to the local hospital for some reason. I offered him my best deal. In order to save the trouble of calling an ambulance, which I won't do for a job like this, I took him and his mates to the nearest bus stop so that they could head on up to their favourite hospital. They thanked me when I dropped them off and they meant it, so I was happy to lend a hand without pandering too much. A muddy resus on a building site got me, my kit and my colleagues rather dirty at the start of a shift. I was called initially to check on a 'male having a fit'. En route this was changed to 'possible MI'. I walked on to the site and saw a builder compressing the chest of a work mate who was lying flat in the mud. I took one look at him and I think I muttered something I shouldn't have said under my breath. Whilst the builder continued compressions at my request, I began taking care of the airway and ventilating the patient. I was working alone with the guy for only a few minutes when another colleague arrived and work began in earnest. Soon there was another crew on scene and a further first responder. During the resus, the patient's heart began to beat again. Then it stopped. Then it started and he breathed spontaneously, albeit slowly, for a few minutes. Then he stopped breathing and we lost his pulse again. He was definitely fighting. We got him into the ambulance after slogging our way up muddy slopes and a narrow set of steps. On the way to hospital his pulse returned but stopped when he got into the resus department. Everyone there worked on him and they too kept catching him and losing him. When I left to get on with my next call, he was on a ventilator and had a pulse but was in poor condition. He is still, as far as I'm aware, in the Intensive Care Unit in a stable condition. I went to see the guy who started resus on him and sat and chatted over a cup of coffee about his role in saving the man's life. He admitted he was scared of the situation and wasn't sure what to do. I reassured him and told him that all of us finish a job like that with some self-criticism. Something we forgot or could have done better. I think I left him feeling less upset about it. I hope I did. Then, wouldn't you believe it, I got a RED3 call for an abcess! Talk about contrasts. The only reason it was given as a Category A was that the guy had agreed to the question "do you have any difficulty in breathing". Whenever I have dental trouble (and I agree an abcess is a painful thing) I don't consider my breathing to be a problem or part of the equation at all. So I went to see him and gave him the number of his nearest emergency dentist. Needless to say I cancelled the ambulance. I would have been given a LOT of grief for continuing that particular run! One of my last calls on my run of early shifts was to a lady who had a very slow pulse and was vomiting. Sure enough, as the GP had said, she was bradycardic - her pulse was consistently below 40bpm and she had been vomiting a lot. She didn't looked well. Her blood pressure was dropping and she felt 'drowsy'. I gave her metoclopramide to stop her feeling sick - this would also make her more manageable when moved by the crew when they arrived. I also gave her atropine to bring her heart rate up and thus, I hoped, her blood pressure. Both drugs worked well and by the time the crew arrived she was stable enough to move. Still very unwell but stable and manageable. She kept her sense of humour throughout, even though she told me she was scared. Of course I also dealt with the usual run of chest pain calls that were nothing of the sort and a few minor cuts and bruises but my last job was to a man who had been bitten by a dog and had lost a bit of his finger. I made my way there and asked control to ensure that the dog was out of the way. I was told that the dog had been fitting when it bit the man. I joked that I might need to give the animal rectal diazepam to settle it down! In the event, the man's injury was quite serious. He had attempted to give the dog a drink but it began to fit again and chomped down (reflex) on his finger, biting the end. He had pulled free and torn the entire top of it off. He had the presence of mind to keep the part and put it in a plastic bag while he waited for me to arrive. I got his friends to place the bag into a separate bag of ice (you should never expose live tissue directly to ice) to keep it alive, hopefully. His amputated finger was bleeding heavily and I took care of that with a tight dressing. I elevated his arm and took him directly to hospital in the car. No time to waste if there's any chance of recovering his finger. I would want the same urgency shown if it was me who had lost a body part, as I'm sure you would. He went straight into resus where they began the process of salvaging what they could of his ravaged digit. Poor bloke. Someone collided with me while I was on a call. Lights were on, sirens were blaring but he just kept going until his vehicle stopped my vehicle. Minor damage to both cars and neither of us hurt but I feel vindicated in my concerns about a collision being on the cards for me. It was my first RTC in 20 odd years of driving. I found myself driving at a stupidly slow speed for 999 calls after that. I'm sure I'll get my confidence back eventually. A night of rain, rain and yet more rain. In fact, it rained all night and well into the morning. Wouldn't you know it, most of the calls were outside, so I got wet a few times. Thank goodness for my over-sized yellow hood. I met a new frequent flyer too. He called us for 'chest pain' and when I got on scene, he was smoking a fag and wandering about. He saw me and directed me over to him. He smelled bad and he kept spitting on me when he spoke, so I politely asked him to stand a little further away so I could assess him from a safe distance. He was complaining that he had angina pains but had lost all his meds. I noticed that he had a hospital gown on and that rang alarm bells with me. I waited with him for ten minutes and an ambulance arrived. The crew knew him and I was told that he was abusive at times and had been thrown out of hospital earlier for racist remarks directed at the hospital staff. It was decided not to convey him because, true to form, he became abusive to us too and wandered off with a foul mouth and a bad attitude (neither of which are treatable or curable). 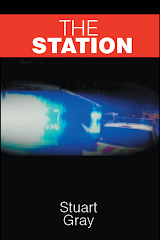 Later on I received a call for an 'assault with chest pain' at another underground station. I saw the age of the caller and it matched my friend from the previous abusive call. I thought it might be one and the same person as I sped off to the job. The police arrived just ahead of me and as I pulled up, I could see my new friend standing with the Underground staff in the station, which isn't even open at that time in the morning! I let the police know that he was trouble and they gave him a new set of rules to live by and sent him on his way. I saw him again later on, standing at the entrance to the hospital. I mentally wished him good luck with trying to get in. Ironically, at the beginning of my shift I was called to an 'asthma attack' in a fast food restaurant and found another frequent flyer at the table, feeling sorry for himself. I have had the pleasure of this man's company on quite a few ambulance trips to hospital for phantom illnesses and so I recognised him immediately (even if I couldn't remember his name). I did my bit and checked him out, after cancelling the ambulance, and discovered that his asthmatic wheeze became more pronounced when I put a stethoscope to his chest. Strange phenomenon. I took him to hospital (what can you do?) and he found a warm bed to sit on for a few hours before they finally and inevitably get fed up with him and send him home. At least he wasn't abusive. I got an early morning call to a drunk with a head injury and sped off to the location only to find that he had gone back to his hotel and wrapped himself up in bed for the night. Best check, I thought, so I went up to his room with a member of staff and lightly tapped on his door. He confirmed (through the closed door) that he was alright and declined an ambulance. Not required. Off I went. Maybe not a funny moment, unless you count a wry smile at the cheek of it, but as I sat in the car at traffic lights in Oxford Street, I saw a woman stagger into a shop doorway and begin to undress her lower half. There were people around but she didn't seem to care. It is rare to see a woman go for a pee in public (well, maybe not rare but unusual) and as she surreptitiously squatted down I moved along swiftly in case I was branded for life by the memory! I'm sure the CCTV guys have got a 'You've been framed' moment to cash in on now. So, a steady and routine sort of shift. I did have a couple of calls that required hospital treatment, including a severe DIB, but it was an evenly paced night for me and I'm glad of that because I needed it. A few days of faints and minor injuries for me, with the odd severe DIB chucked in for good measure. I didn't do anything beyond first aid most of the time but I could hear a lot more going on over the radio, including a number of cardiac arrests and a few RTC's, many of which happened on the one and only day we got snow. I drove to work that morning at 5.30 to find that none of the roads had been treated. Not as much as a grain of sand on them! Needless to say the journey took twice as long and I made it in by the skin of my teeth. One of the more interesting calls I received was to a school. The call description read 'child choking on tongue', so I took it seriously and sped off in the direction of the school. When I arrived the ambulance drove up behind me and the crew followed me into the school reception. We stood there for a few seconds while everyone, kids and staff, eyed us up with interest. Nobody knew why we were there. My colleague asked one of the teachers where the choking child was and she looked at her in confusion. We explained that we had been called to a choking child at this school and I said jokingly, "unless one of the kids has a mobile phone on him", to which the teacher replied, "Well, yes they all have their phones". I was dumbstruck (is that one word?). It was kind of old fashioned of me to perhaps think that the children would not be allowed to bring their mobile phones to school. The fact that they have a mobile phone (aged 6 - 12) is shock enough. Anyway, that's when it all started to jump into place. This child had used his (or her) mobile phone to call 999 to see the ambulance arrive at the school. Unfortunately for child X, his/her voice was recorded when he/she made that call and the number was logged so it can all be traced to him/her quite swiftly. Uh-oh. We gave the head-teacher (is that one word?) the number and left him to dole out suitable punishment or report as appropriate. I found it all very amusing though and would love to have seen the little urchin getting brought before us to explain himself. Still, I was no angel myself when I was young so I understand the thrill he/she was seeking. I got a ghost call from the Inland Revenue Office. I have gone to several of these calls before and they are quite strange. Our control receives a call via the 999 operator but there is nobody on the line and so it appears that the call was made but the person who made it hung up immediately. This prompts a 'please investigate' message when we receive it on the MDT. In these cases, as with the Taxman (that's one word surely), the number does not exist at the location given by BT's number referencing system. I walked in and was asked what I wanted. A tax refund or to be left alone was my instinctive response but I didn't say it. Instead I asked if anyone had called an ambulance from this number and was told no. The usual. The security guy came down the stairs and asked for the number from which the 999 call had originated. I gave him it and he looked through the building's directory for it. It wasn't there. As usual. Now I think the non-existence of these numbers is due to the 'ghosting' of them. British Telecom will keep a number unused for years - they don't necessarily re-allocate it. The number may have belonged to that particular building sometime in its past but now a short circuit or an internal wiring problem causes a call from a different number to trip over onto that number, thus it appears to have originated from the ghost number. You follow? We still have to chase these things up because one day it will be someone up on the twelfth floor having a heart attack and nobody knows any better. If the number exists and is functioning at the location then we will do an 'area search', or the security guy will. If I did an area search of that building I would divert some of my attention to finding and 'losing' my tax files. I gave a homeless person a lift back from hospital after he agreed to accompany his aggressive friend for the safety of the ambulance crew transporting him. I conveyed him back to his starting point South of the river after his friend was securely passed on to the hospital staff. During the 20 minute journey he started telling me of his travels. He stays in London during the Winter then he goes to Brighton for the Summer. He listed the places he had travelled to in his carefree (and including employment-free and tax-free) life. This guy had visited more of the UK than most of us will in a lifetime. I would cry but I'm too big for that nonsense. I have attracted a lot of attention to this blog, mainly because of the way I write it. I didn't know what was going on online and in my work environment until I was finally told by someone who has known me for a long time. As you know, I have had a few over-critical comments made on my postings (some, to be fair were just badly worded and I did think them over). I have also had a few problems at work as a result of this blog and the way I appear to be to others (possibly because they make assumptions about me as a result of my writing). I have discovered just how much blogging is loathed in the profession. All except one site is berated at some point by 'professional' colleagues who just can't stand the idea of anyone writing down what they have done during a shift. Fair enough but it is an exercise in free speech. Nevertheless, I have also discovered how much I have offended a few people as a result of the style of writing I have. I have had a look at my earlier postings and I can see what the fuss is about. I do sometimes come across as arrogant and self-serving. Someone has the impression that I don't like EMT's (Techs) and that I cannot understand. I am an EMT with a bag surely? Most of my friends are EMT's. So I have put the record straight on 'their' site and I am doing it here because you all need to know that writing about this job is a very tricky thing to do and it has profoundly affected my work environment. I confess to being a little less than careful about my wording at the beginning and so I have steadily developed another style of writing (you may have noticed). I have been pulled up for being too graphic and I am no longer willing to write about my experiences in such detail (I will do that in my private reflections). Graphic details may offend someone involved or who has had a similar experience. 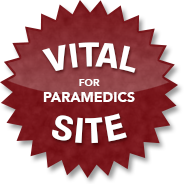 I will no longer refer to myself in terms that isolate EMT's to a lower level, which I never intended to do and never even noticed (neither did my readers). When I referred to me being the paramedic on a job or having to take over that was not a deliberate attempt to make EMT's look bad or beneath me. I see no difference except that I have to do certain things in certain situations and have to be damn careful about my registration. As for deleting comments, well some of them just can't be published! I never as much as leave the thumb print of profanity on my site. Not that I don't swear, of course I do, just not much. It's a poor use of the English language I think. The main reason I keep my site so clean is that children read it with interest; I know this because of past comments made by their parents and so I will not tolerate the use of foul and offensive language. I read a book years ago called 'Blue lights and bandages'. 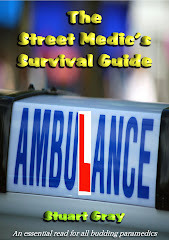 It was written by a man who had served over 30 years in the ambulance service in Scotland. It was a very graphic and revealing book and it was about real people. 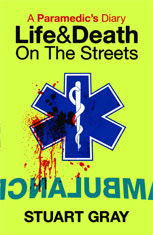 It helped me make up my mind about becoming a Paramedic and I didn't find it in the least embarrassing or offensive. I saw it for what it was. I began writing this blog, without knowledge of any other of its kind, with that book in mind. What I didn't know and have had to learn, is that people in this business do not want to read about it and that a few will do the worst that they can in order to gag you. This has been a shocking lesson for me because I wandered into this place thinking it was full of like-minded people. Even at my age, I was naive. I was writing it for YOU not them. I am now more aware of how I interact with my colleagues and will be a lot more careful about how I behave. Not because I have been bullied into it - I don't respond to that rubbish. I am doing this because I am part of a very large team and I need to respect the rules of the game, even if my whole life has been conditioned in the opposite direction. I'm adapting, that's what I am doing. All it took was someone to tell me man-to-man what was going on. I respond well to being spoken to like a grown up. This blog will continue because a LOT of people read it. You don't say much but I think that's because you like to read it more than comment on it. In any case, your kind and supportive comments alone are enough to draw the fire of the few. Can't win, right? A routine (but never run-of-the-mill) few shifts. Early starts, which I prefer, with a few decent spells of sunshine. It was sunny enough and warm enough on Saturday for the tourists to come back and flood Central London. It was extremely busy and it felt like Spring had arrived - in February! That's global warming for you. I dealt with a number of varied calls over the weekend. A elderly skater who fell hard on the ice and broke his humerus. He was with his grand-son and this was one of the things they did together. It was a significant break and the mid-shaft of his upper arm kept 'wobbling' around when he moved. I told him it was probably best not to move and he agreed. The humerus is the upper arm bone and we tend to call the extremity, at the elbow, the 'funny bone' but there is nothing funny about breaking it. It can be extremely painful and dangerous; nerves, muscles and large blood vessels can be involved. I was asked to assist a PTS (Patient Transport) crew that had been assigned. They had tried using entonox for the pain but it hadn't touched it, so I offered him morphine, which he gladly accepted. The drug had some effect but he was still in pain and moving him, with his now immobilised arm, was tricky. His grand-son, meanwhile, was enjoying the drama! Earlier on I attended a bus vs. pedestrian in which the young man sustained a deep head wound when the bus hit him as he was stepping from the pavement. He was Italian and was probably looking the wrong way when he stepped out. Or not looking at all. He was also complaining of chest pain and a witness stated that he had fallen hard onto the pavement after the fight with the bus. This may have caused a chest injury and it was entirely possible, given that his pain became increasingly worse and widespread, especially on breathing, that he had developed a punctured lung (pneumothorax). A broken rib is all it takes sometimes. The condition isn't necessarily life-threatening but can develop into a more complicated problem if left unchecked, so he was rapidly transported to hospital - no staying, no playing. A drunk with a great deal more confusion and disability than would be expected prompted a call for a possible CVA (stroke) and I did my best to communicate with him but the alcohol, or the intracranial pressure, was working against me and all I got was slurred English, which sounds like heavy Scottish and since I have been down here so long I find it difficult to translate either! A strange RTC in which the casualty lay in the middle of a busy roundabout, complaining of a thigh injury. Witnesses, including the driver of the car who knocked him off his bike, say the collision speed was no more than 10 or 15 miles an hour and that he had not made contact with the car at all. Initially, he wouldn't even speak to the crew on scene and only started chatting when he was being treated. He got the whole nine yards: collar, blocks, scoop but I have my doubts about whether he will benefit from it. Old people who have sad stories always bring a tear to my eye. An elderly gentleman had called us because he had chest pain. It turns out he has a chest infection and is alone. He told me that his wife had died late last year. They had been married for over 5o years. He told me he missed her terribly. I was thinking that, in my experience, the elderly don't tend to hang around too long after losing a significant part of their lives. Even a chest infection would be a good excuse to follow a loved one. I'm willing to bet that those of you who work with the elderly have seen this too. 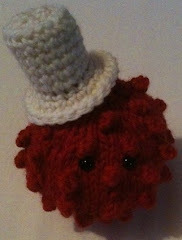 Then Mr. Swollen Tongue (not his actual name) presents himself to me after calling 999 for 'allergic reaction'. Sure enough his tongue is swollen and sure enough he has a letter from hospital listing his meds for an allergy to a specific drug he was taking but there is no emergency protocol for him and he is homeless and shivering and hungry, so he needs to go to hospital for those things at least because no-one else gives a damn about him. The crew turn up and oblige because they are nice people and they care. I think I saw a rare case of dystonic reaction, where the muscles become tense and uncontrollable as a result of a reaction to (usually) medicines or drugs. The man was lying on his bed with his toes curling inward (first thing I noticed) and a certain overall rigidity about his body. If he stood up, which I asked him to do, his back arched abnormally as if he was about to dive into a pool for Olympic points. It is a strange problem and I have only ever seen two or three cases. I gave him a little bit of Diazepam and he relaxed. His rapid heart rate also began to settle and off he went to hospital. I didn't go in with him so I don't know for sure that my diagnosis (or opinion if you prefer) was correct but he was treated and conveyed appropriately and that's good enough for me. There's a guy who walks through Leicester Square and Covent Garden doing a particular dance routine. He carries a long stick and he will march forward a few steps, stop, turn around, point his stick in front of him and then continue a few more steps. He stops, spins, walks backwards and then points with his stick over and over again. It's his routine and although everyone stares at him as he passes, he is generally left alone. I have seen him four or five times now and his eccentric behaviour always makes me smile. People like that are not mad and they are not a problem. People like him are on this Earth to ensure that we never forget that life is not that bad and shouldn't be taken too seriously all the time. If I get one smile out of my day then I'm perfectly happy. Haven't heard from anyone, except by email, for a few entries. Let me know if there is a problem with this new commenting system. Otherwise, why aren't you talking?